In the year 2016, while the U.S. elections overshadowed everything else, five states in the U.S., namely Arizona, California, Maine, Massachusetts and Nevada had initiatives to legalize marijuana for recreational use. Following the 2016 ballot, Arizona voted no, while the remainder of the states such as California, Nevada, Montana, North Dakota, Arkansas, Florida, Massachusetts and Maine voted in favor for using marijuana for recreational purposes. This comes on top of 17 other states including Alaska and Hawaii that have already legalized marijuana in one form or another. The trend in legalizing marijuana has been increasingly prevalent and it seems quite surprising that only until few years ago, being caught in possession of marijuana in many states of the U.S. could have meant having to face the courts and perhaps even prison time. Times are changing as far as marijuana is concerned and the current state of affairs reminds one of the times when prohibition on alcohol was lifted. As an interesting note, states such as Massachusetts and Maine were actually some of the first states that acted on prohibiting alcohol. For example, in 1838, the state of Massachusetts passed a temperance law that banned sale of spirits in less than 15-gallon quantities. And in 1846 Maine passed the first prohibition law. Arcview Market Research, which is a leading name in Cannabis research estimates that the market for both medical and recreational marijuana is expected to rise to $22 billion by 2020 while financial services firm, Cowen project $50 billion market value by 2026. The industry is currently valued around $7.4 billion with over 28 states allowing the use of medical marijuana and some states allowing for legal use of recreational marijuana as well. But the marijuana or the cannabis industry is still in its nascent stages. Although investor interest has increased over time, marijuana stocks are still treated as penny stocks, trading under $5 a share and having a market cap of less than $300 million on average and it is not uncommon to find stocks in a boom-bust pattern thus requiring more than the additional due diligence when dealing with stocks in this sector. What this means for investors is that once you brush aside the buzz associated with marijuana stocks, the stocks are still penny stocks and come with the usual risks associated with penny stocks. Therefore, investors need to get the full picture before riding the buzz and focus on a number of aspects. And this is something which some insiders in the industry even agree too along with the SEC which has already issued a warning that the marijuana industry is quite susceptible to fraud and can be used to lure investors with the promise of high returns. Within the marijuana investing industry, there are only a handful of stocks that can boast of having a larger market cap. The industry is also relatively new, having been in existence since late 2015 and early 2016. But if the current trend continues, there is a very strong chance that some big names could emerge over the period of the next three to five years. To get an idea of the stocks that are listed in the cannabis sector, the U.S. marijuana index chart listed below is a good place to start. It shows the total market cap for the industry which is at $4.84 billion This puts the entire marijuana industry in the mid-cap sector with a total of only 17 constituents listed on the index so far. What are the top stocks in the Marijuana sector? 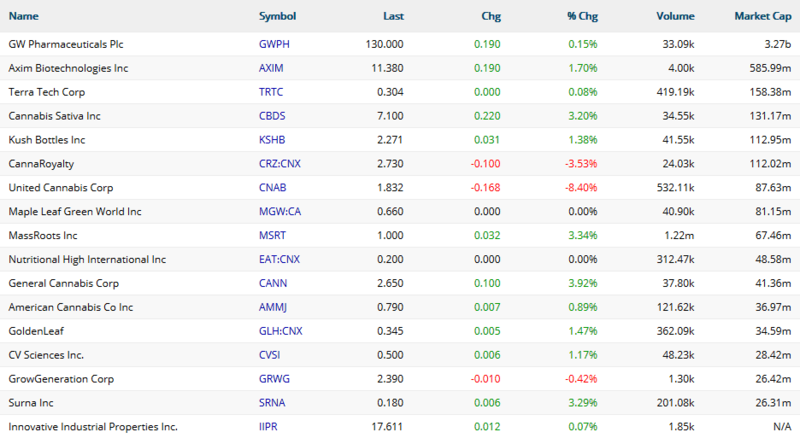 The table below shows the total of 17 odd stocks that are listed on the Marijuana index (not an official index). These stocks are considered the top of the list of Marijuana stocks as they need to meet minimum criteria of having a market cap of $10 million with a daily trading volume of $20,000 or more. If you dig deeper you can find more risky OTC stocks from the marijuana sector but with smaller market caps and lower trading volumes. 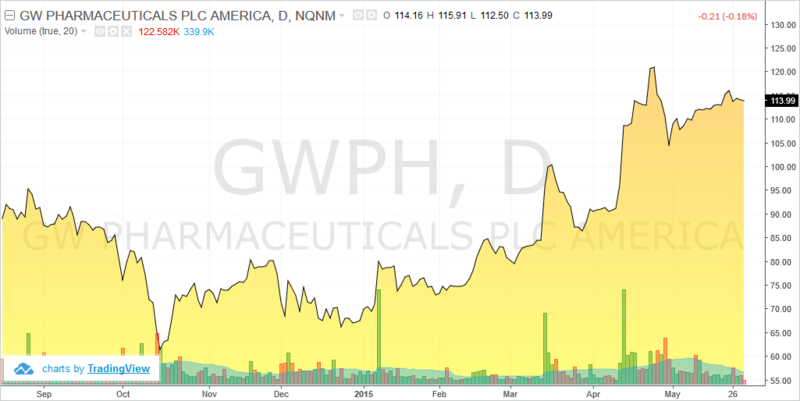 Of these 17 stocks that are listed, only the top company in terms of market cap is GW Pharmaceuticals Plc (GWPH) which boasts of having $3.2 billion. The remaining of the listed companies are names like Axim Biotechnologies Inc. (AXIM) which comes in at the second spot with a market cap of $585 million. With the exception of a few names, most of the stocks listed on the Marijuana index are traded over-the counter. The few names that are listed on the NYSE or NASDAQ have had history of dealing with other products as well but have been known to be early movers into the marijuana industry. GW Pharmaceuticals is a biotechnology/pharmaceutical company that focuses on specializing therapeutics from the cannabiniod product platform. 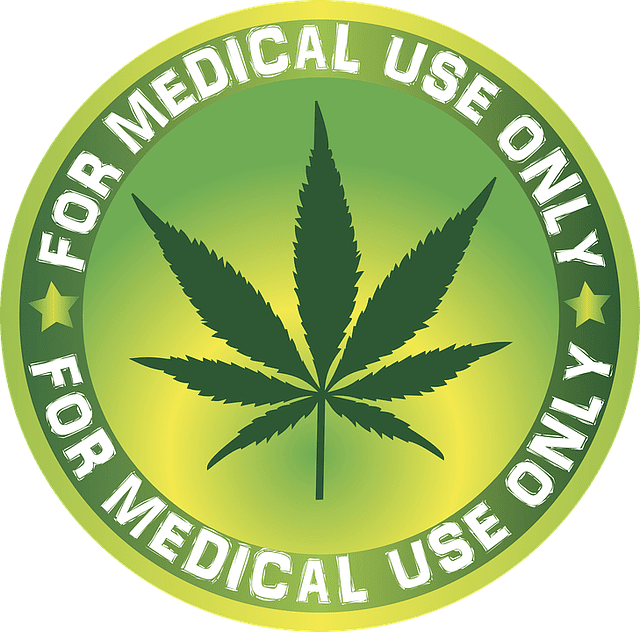 Most of the drugs from GW Pharmaceuticals are geared towards medical usage of marijuana and includes some names that are already in the market such as Epidiolex and Sativex. GW Pharmaceuticals has three segments, namely the commercial, Sativex research and development and the pipeline R&D segments. GW Pharmaceuticals is based in headquartered London and has offices in the U.S., Canada and Asia. Among the many different stocks in the marijuana industry, GWPH is probably one name that often comes up and is uniquely positioned for concentrating its research into the cannabis industry while also holding its ground as biotech research firm as well. Considering the fact that very little is known as to the effects and the uses of marijuana especially for medical purposes, all it takes is a single breakthrough for the stock to make huge returns for its investors. If one were to remove cannadiniod from GW Pharma’s research, the company would be on part with any other regular biotechnology company. Besides, GW Pharmaceuticals, there are some existing names in the industry such as AbbVie Inc. (ABBV) which are already established names in the field of pharmaceuticals and biotechnology R&D. AbbVie also has a few product lines geared towards developing products using Marijuana. Although in terms of a pure play stock for the Marijuana sector, AbbVie doesn’t quite fit the bill. Besides the above stocks, industry insiders suggest purchasing stocks of companies that deal with supplying the marijuana industry. These secondary stocks are said to be more reliable and have a diverse set of business, with usually one segment of their business dealing with supply of chemicals, lighting and other equipment required in growing and in conducting the research and development of the marijuana industry. One such name that often comes up is lawn-care products make, Scotts Mircale-Gro (SMG). The company has made inroads into developing hydroponics with the CEO, Jim Hagedorn betting that the marijuana industry will grow to be a billion dollar industry. Staying true to its convictions, the company has already acquired smaller companies such as Gavita, which is a Dutch company dealing with grow lighting and also has bought out other companies that supply hardware, fertilizers among other things. What makes SMG a safer bet among the more risky OTC shares is the fact that SMG has a market cap of $5.59 billion and trades on the New York Stock Exchange, making SMG another name worth considering when it comes to investing in the marijuana industry. Most first time investors to the Marijuana industry might feel these stocks to have high growth potential, especially after recent changes to the legislation and wider adoption and recognition of using marijuana for medical purposes. Marijuana stocks have been high flying for the most part of 2016 and the industry merely got a shot in the arm with the November 2016 legislation. As with any industry, it is imperative the investor do their due diligence into the sector and for something such as Marijuana as a product, investors should also pay attention to the government and medical legislations as well. Because marijuana is treated as a schedule I drug, the industry is exposed to a harsher tax treatment. This means that dispensaries and different companies along the supply chain need to adhere to strict practices and protocols that include linking every sale to a source as well as every part of the process being well documented. Due to the known restrictions that still face the marijuana industry, financing is a major problem among companies especially when it comes to banks or finding institutional investors. A 2015 article in Bloomberg goes as far as to show that back in the day over $3 billion in annual revenue from dispensaries failed to find its way into the regulated banking system. However, things have changed in just one year, which shows the importance of how legislation can help industry overcome hurdles quite quickly. This is however changing, albeit at snail’s pace. In December 2016, there were talks about bringing reforms in the banking industry in support of cannabis. The U.S. senate appropriations committee was heard of determining the allocations for the year 2017 in a bid to sponsor an amendment for bringing wide scale reforms in the banking sector related to cannabis industry, which was a welcome move. This led to some early movers in the financing sector for cannabis companies. SingleSeed is one such name that is specializing in offering cannabis specific financing. SingleSeed is a subsiadiary of SinglePoint Inc.). The company has so far spearheaded changes by means of enabling point of sale devices, mobile marketing for retailers and other forms of payments such as cashless ATM's and so on. There is also a risk of too much competition in this still nascent industry, which exposes the fact that some companies could still shut down while on the best could probably think of long term survival. Also considering the fact that there are only limited resources in the industry, it is only a matter of time before a large consolidation in the industry will shake out the weak players. Another major threat to the industry is also the new U.S. administration. Attorney General, Jeff Sessions has been an staunch opponent of legalizing marijuana (in the past) but his past rhetoric is seen as a risk of a federal crackdown on the sale and usage of both medical and recreational marijuana. Although many of the major companies operate with the legal constraints, most of the smaller companies tend to step into the grey area, making it difficult for normal investors. Furthermore, due to the fact that a majority of the companies are traded over-the-counter, they are susceptible to a lot account fraud as well as pump and dump schemes which are a common occurrence in the pink sheet trading. 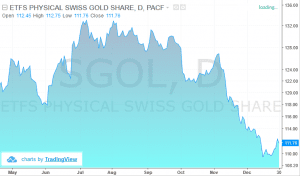 It is not surprising to find that at times even the so called safe companies can go bust. A good example of this is Notis Global Inc (NGBL), formerly known as Medbox. In early 2015, the company forged a name in the marijuana industry dealing with the supply and operational aspects such as dispensing or vending machines with fingerprint technology. The company was also dealing in hemp and CBD oil saw its shares tank in the OTC market. In conclusion, investors might have mixed feelings when it comes to investing in the marijuana industry. This is perfectly understandable considering the social stigma when it comes to marijuana users. However, with new inroads being made into the usage of the plant, especially for medicinal purposes, savvy investors can look beyond the moral aspects and reflect on the positive side of the industry, which is in spearheading new research into a plant that has often been banned for abuse but at the same time, opens up possibilities to deal with new approaches to treating critical diseases. The marijuana industry is estimated to have grown 17% since 2015 and is estimated to have increased by over 25% in 2016 alone.